Scottish soccer team Partick Thistle unveiled their new mascot this morning. It’s that. Why. Mike Wilkins, managing member of Kingsford Capital and art aficionado, found himself taken with the Maryhill club after a chance meeting with one of his favourite artists, the Turner Prize nominated and long-time Jags fan, David Shrigley. When the pair met several years ago at a dinner in San Francisco, the conversation quickly turned to the Maryhill side. After a bit of independent research, the Californian’s mind was made up to support Thistle and, much to the club’s surprise, called Ian Maxwell directly to get the wheels in motion. Since that initial conversation Shrigley has maintained his involvement and has designed a unique Kingsford logo which will adorn the front of Thistle’s shirts and be featured prominently around the stadium. 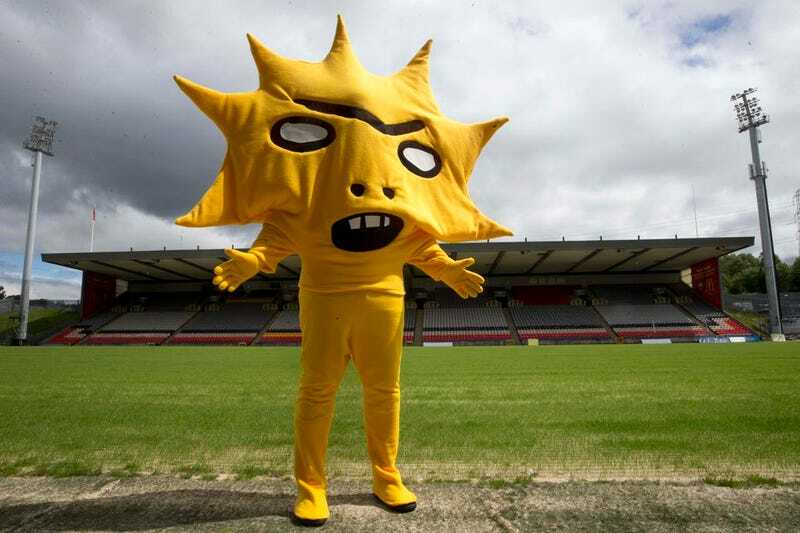 In addition, a new Shrigley-designed mascot, named Kingsley, will be in attendance on match days. This marks the ignominious end of previous mascot Jaggy MacBee, who flittered away the four short years of his life, never knowing that he’d be squashed with a paper towel the second his corporate benefactor deserted Thistle. Thistle’s motto for this season is “not so cuddly anymore,” which seems kind of obvious. It’s the sun! You couldn’t get within 40 million miles of that mascot without being incinerated and ionizing into a plasma! Kingsley is bad.